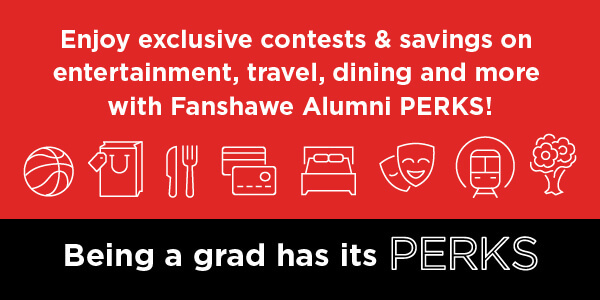 Fanshawe Alumni PERKS is your all access pass to exclusive contests, savings on entertainment, travel, dining and so much more. With PERKS available in virtually every category, there’s something for everyone. Become a member and Login to access exclusive contests, events and PERKS. Show your mobile (or printed) PERKS pass at participating locations to receive exclusive savings. Follow us on your favourite social channels to stay up to date on the latest contests, events and PERKS.